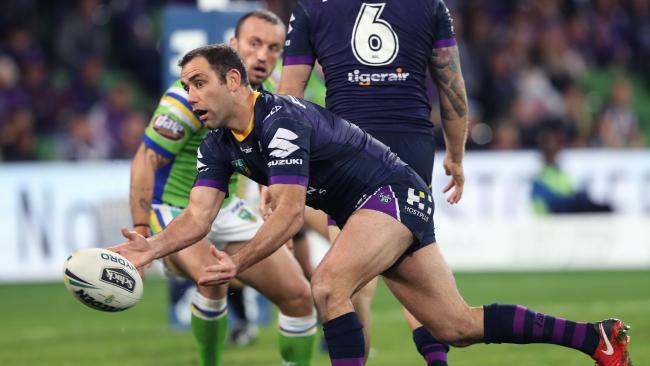 MELBOURNE Storm coach Craig Bellamy has warned the attack could improve further after a taking a "step forward" on Saturday night against Canberra Raiders. Storm powered past the Raiders, 44-10, scoring seven tries to two in dominant display at AAMI Park. "I thought some of our construction of a couple of our tries was really good so that's a step forward," Bellamy said. "Hopefully we can keep that up or get a little bit better. "Jahrome (Hughes) is still finding his way in that (halfback) position and the more he plays I think it will run a bit more smoothly in the next few weeks." The halfback role has been problematic for Storm, having tried three youngsters in the playmaking position without settling on a regular No. 7. Hughes showed great poise on Saturday night, setting up try for Suliasi Vunivalu deep in the first half after taking heavy contact to the head and shoulder region from Raiders centre Joseph Leilua. He also connected with backrower Felise Kaufusi for a linebreak assist. While the Raiders gifted Storm way to much possession and territory Saturday night on the back of fundamental errors, the reigning premier capitalised on the gifts. The emphatic wins sets up a top-of-the-table blockbuster against South Sydney on Friday night at ANZ Stadium. 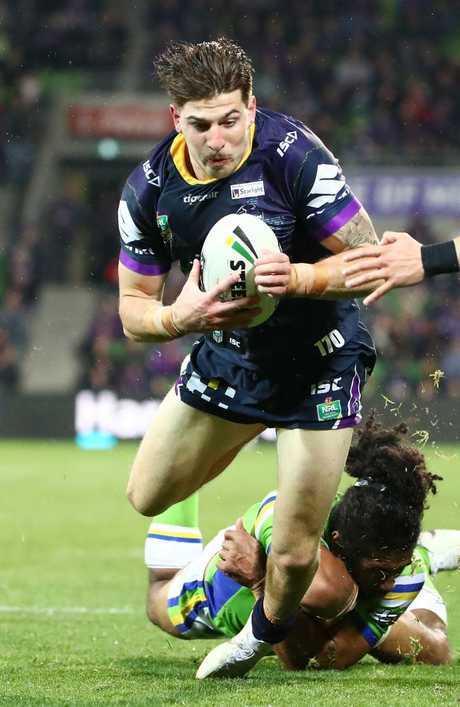 Storm fullback Billy Slater went off late in the second half but Bellamy on Saturday night ruled out any injury concerns. Bellamy said Slater copped a knock to the "knee or shin" late in the first half and Storm opted for the conservative approach with the game in hand. "I don't think it was anything major, obviously at that stage we wanted to give Cheyse (Blair) a run, we had him on the bench and he was fresh as," Bellamy said. "It was the safe way to go with Billy and he thought it was the way to go too, so I've got no doubt he'll be right for next week." premium_icon How safe is your coach heading into 2019?